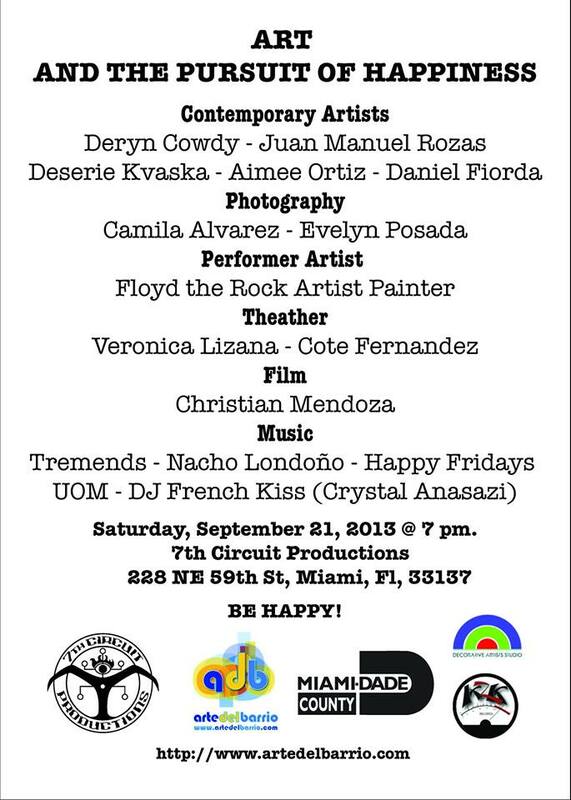 ‘Arte del Barrio’ is proud to be back in Miami’s art scene with its 9th multimedia art show since 2003. On September 21, 2013 fifteen artists and performers will develop and present their own art manifestation inspired by the quality or state of being happy. The selected topic will allow artists to focus on the experience of living and working with the current economic, spiritual and emotionally changing times. Is poverty more than a lack of money? Does the economy affect the art world? Is there is such a thing as The Gross National Happiness Index? How do we measure well being? Saturday, September 21, 2013 @ 7 pm. ‘Arte del Barrio’ is a multi-cultural cooperative group of new and well-known local artists introducing and instilling their multi-discipline artistic visions in South Florida. The AdB group consists of painters, photographers, sculptors, video-film makers, musicians, DJs, performance artists and theater/film actors coming together in order to showcase their creative talents while elevating the cultural and artistic awareness in our community.